A brown recluse spider. Credit: Rick Vetter. The brown recluse spider is on a lot of minds. Usually between 6-11 millimeters in body length, this spider has a venomous bite. Just about everyone thinks he or she has seen this spider running through the house or claims to have been bitten by one or knows someone who received the bite. "Yet, there has been no authoritative book on the subject," says Richard S. Vetter, a world-class spider expert. That has now changed with the publication of "The Brown Recluse Spider" (Cornell University Press, 2015), a book by Vetter that is the culmination of his 20 years of work on the brown recluse with research still ongoing. "Doctors in places like Canada and Alaska are diagnosing patients with brown recluse spider bites when no brown recluse spiders have ever been found in those areas," says Vetter, who retired in 2012 from his job doing entomology research at the University of California, Riverside. "Some of the conditions being misdiagnosed as recluse bites can be fatal if not properly medicated. Many misconceptions and myths need to be dispelled. I have been publishing in the scientific and medical journals on this spider for nearly two decades. There was a need for a brown recluse book for the general public, and that is the niche this book fulfills." Born in Elmont, NY, Vetter received his bachelor's degree in biology from Adelphi University and his master's degree in zoology from Arizona State University. He began working in the Department of Entomology at UC Riverside in 1980. He has more than 135 publications in scientific and medical journals, including the New England Journal of Medicine, the Annals of Emergency Medicine, The Lancet, the Annual Review of Entomology, Toxicon, and the Journal of Medical Entomology. He is also the author of three book chapters and a previous book. He has named two spider species; two spiders and an arachnid have been named after him. "Having retired a few years ago, I had time to finish this book," Vetter says. "There has always been a need for a book like this. 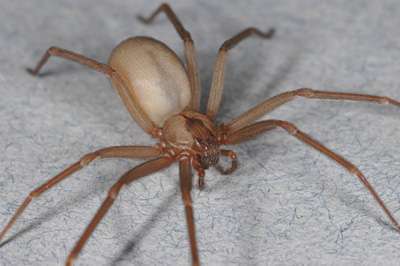 It corrects many misconceptions about the brown recluse." "In between flights, I would flesh out a draft chapter," he says. "I would revise it years later." Vetter's interest in spiders - specifically, predator-prey interactions - began as an undergraduate. Questions he pondered over include: How do prey items hide from predators? What defenses like camouflage or spines do they develop? How do predators find prey? And how do predators overcome prey defenses? "It was fascinating to me to read about stick insects or see pictures of butterflies that mimic dead leaves to the extent of having veins of leaves and even holes in their wings to make them look like they are old, rotten and inedible," he says. "Caterpillars that mimic snake heads when disturbed. Caterpillars and spiders that mimic bird turds so that predators don't see them as edible items. Mantis insects that look like orchids and hide in plain sight on flower heads so flying insects don't detect them and think that they are flowers and then get eaten when they land. All very amazing!" For his master's thesis, he began working with black widows because of their warning coloration and venom. "It fascinated me that a bite from a tiny spider putting a little drop of venom under your skin could cause such devastating reactions and sometimes death in humans," he says. "I also was fascinated by the human psychological response or overreaction to spiders. How is it that a creature that weighs about one millionth of a human could induce such a fearful response? As this led to the brown recluse, I realized in the early 1990s that there was no arachnologist working on this spider and that all the stories being written were authored by people who had no real scientific experience with the animal. I felt that there was a need for an expert on the brown recluse spider and that I could eventually become that expert." "The Brown Recluse Spider is a concise summary of the current knowledge about an infamous spider, with clear relevance to the public perception of spiders in general. Richard S. Vetter has had years of experience conducting research on recluse spiders and educating the public as well as medical personnel. This book features new insights—interesting, amusing, and sometimes sad—drawn from his personal experiences with education efforts. "—Richard A. Bradley, The Ohio State University, author of Common Spiders of North America. Wounds exhibiting necrotic pathology are very frequently misdiagnosed as Loxoscelism, the unfortunate result of a brown recluse bite. Luckily this unwanted reaction to a BR bite is not an inevitability. Also, most spiders, especially small ones, cannot even open their chelicerae wide enough to bite human flesh. Most people who think they were bitten by a spider were actually bitten by something else. Spiders really just want to get the hell away from anything as large as us. Years ago I had a date with a biology teacher friend of mine. The next morning she pointed out an array of various spiders living by her apartment plants, and educated me quite well about the realities of arachnids. Ever since then, my habit has been to relocate any wandering spiders in my own house to better feeding grounds, usually a houseplant. My wife and I have been doing that for years now. Our cats think anything that crawls around is fair game, so we inevitably lose a few good spiders that way. A few years ago while cleaning out my garage in Louisville, I realized hundreds of brown recluses also lived there. This I verified through magnification and several enlightening communications with a local agricultural extension agent. I owned this place for a decade and never knew I had recluses. Nor had I knowingly ever been bitten by one. Brown recluses do not build webs. They prefer to live in boxes, newspapers and wood piles. I soon discovered a portion of our house spiders were also recluses. Knowing what I have always known, I decided to basically ignore them. One night last summer, while working in my garage both barefoot and shirtless, for the first time ever I was bitten - twice, right at edge of my shorts. Hours later the spots did develop the precise appearance of classic initial brown recluse bites. But the spots subsided within a few days. I since learned that necrosis is NOT an inevitability. I don't react much to bites or stings anyway - that bodes well for me.